This is a poster for the new movie Our Family Wedding. 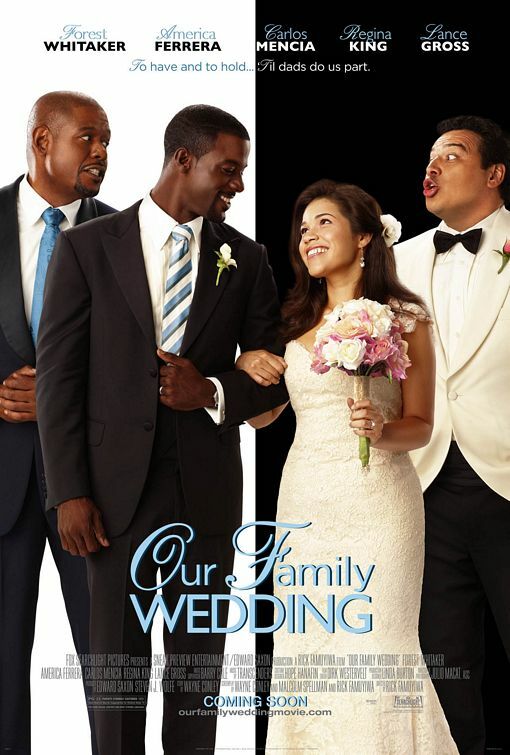 What I find most interesting about this poster is that it seems to stress the interracial aspect of the pairing with the black and white vertical division between the groom’s side and bride’s side (although, the couple isn’t a black/white couple, it is a black/latina couple). I haven’t been able to find out exactly how important that element is in the movie, but it doesn’t actually sound like that’s the focus. It sounds like the movie is more about the couple’s parents taking over their wedding (which, in true movie fashion, needs to be thrown together in just a few weeks for some reason). Obviously, they do deal with the race issue and talk about cultural traditions, but it doesn’t seem to be in a “we don’t marry their kind” sort of way, it seems to be more a “I don’t know their traditions” kind of way (and the fathers have a history before they even know their kids are acquainted, much less getting married). The arrangement of the people is interesting. The couple is looking happily at each other while their fathers look over them and seem to be “discussing” something strenuously. This seems to convey more of a feeling of their fathers disapproving of the match, which doesn’t sound like it’s what the movie is about, than of their fathers taking over the wedding. It does, however, go with the interracial-marriage-being-an-issue idea. I don’t think that I like this poster. It’s a well designed poster and is visually a great piece of graphic design, but I don’t think it works for this movie (unless the internet is very much lying to me about what this movie is about). I don’t know. Does anyone else have any thoughts about this poster? This entry was posted on March 29, 2010 at 12:00 pm	and is filed under Entertainment. Tagged: movie, our-family-wedding, poster, race. You can follow any responses to this entry through the RSS 2.0 feed. You can leave a response, or trackback from your own site. I like the fact that they depicted the couple as absorbed in each other and honestly looking happy. They do look like a couple who are getting married and not particularly thinking about their families or any other issues that might be looming over them. I’ve seen plenty of “wacky wedding” posters that didn’t show this, instead going for something silly or the couple physically separated or cornered in some way. This poster does convey to me that the two of them are getting married for the right reasons, no matter what else is going on. The black/white might be implying the interracial nature of the marriage, but I think there’s also decent odds that it’s just playing off the colors of the tux and wedding dress to create a visual divide between them. I agree with you that the father’s expressions are a little weird (assuming they don’t have issues with each other or the marriage it’s a little inappropriate), but they do at least convey that there may be some family troubles present in the movie.